There are freethinkers, free spirits, risk takers, right makers, dreamers, and doers who are standing up to support Together, We Dream. Here is one story that explains why. 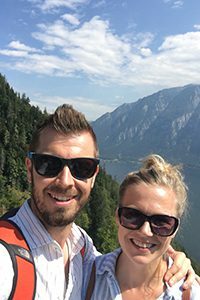 Meet Mike Velin ’06 and Ashley Cooper, MPA Middle and Upper School counselor. We think the improvements the school intends to make will have a large impact on our children for several reasons. There will be a direct benefit that they will receive by having new spaces to learn and explore in the library/common spaces, but also the ability to push themselves outside of their comfort zone by trying new things in the test kitchen. Indirectly, the new spaces will create a higher demand in a competitive independent school market. Not only will a more diverse student body be encouraged to come to our school, but a more diverse faculty will be excited to thrive and teach in our new space. At the end of the day, the campaign and our annual fund are two separate, but very key pieces to the overall health of our school. It’s planning for today, while investing for tomorrow. We need to stay competitive with other schools while providing a diverse setting in which students can learn—so we need to invest in our future with the campaign. While at the same time we need to also plan for our current students and faculty through the annual fund by bridging the gap between the cost of the school year and the amount of tuition paid—without this, there will be no future for our kids to reap the benefits of our investment in the Campaign. I continue to feel blessed and in debt to the school and community because without the friends, family, and faculty at MPA, I believe my path would be somewhere completely different than it is right now. I benefited from a caring group of individuals that gave everything they had to allow us to succeed and I want to make sure that I can help other children feel the same way too. We were raised on a spirit of giving back and I want to continue to that notion of paying it forward for the next generation. Each priority has it’s own set of goals and students that it will impact, however ultimately all four will allow the school to continue its mission of intellectual ambition with the joy of learning. Our dream for MPA is that all students feel comfortable and accepted for who they are and feel like they are a part of a community that they can thrive in by being themselves, while being pushed to step outside of their comfort zone. MPA will never be the right place, for all students. But we should work on being the best place for the students and families that we have.